These Clear Heavy Duty Solar Blankets, manufactured by Midwest Canvas, are made to give you the maximum heating and insulation properties, combined with long life. Heavy Duty Durable 16-mil Clear blankets are loaded with thermal bubbles that retain heat at night and on cloudy cool days. 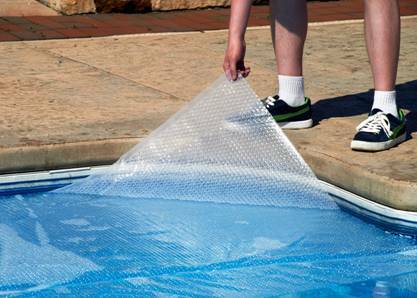 The transparent Clear color helps ensure that the sun's heating rays are reaching your pool water. Your pool will be up to 15°F warmer than an uncovered pool. All blankets are U.V.-protected so they last under the most intense sunlight. They are backed by a 10-Year Pro-rated MFG Warranty with 2 years full. Solar Reel Sold Separately.